Modifying Food Texture, Volume 1: Novel Ingredients and Processing Techniques discusses texture as an important aspect of consumer food acceptance and preference, and the fact that specific consumer groups, including infants, the elderly, and dysphagia patients require texture-modified foods. 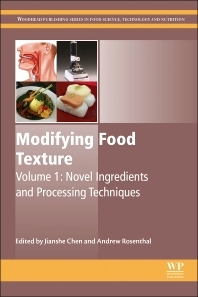 Topics covered include ingredients and processing techniques used in texture modification of foods, an overview of food texture issues, the novel use of processing techniques for texture modification, and the uses of food ingredients in texture-modified foods. R&D managers in the food industry, particularly those concentrating on niche consumer products and food formulation; hospital dietitians; postgraduate students and academics with a research interest in the area.